Strengthen digital participation of young people! On 27 and 28 September 2018, the Institut für Europäische Politik (IEP) had the pleasure of holding the #1stYoungCitizens’FutureLab on “Digital Democracy in the EU: e-participation and European election” at the Europäische Akademie in Otzenhausen (EAO). Together with Anja Türkan, an expert of digital strategies, the participants discussed the challenges of e-participation and digital tools for citizens’ involvement in the context of the next European elections. 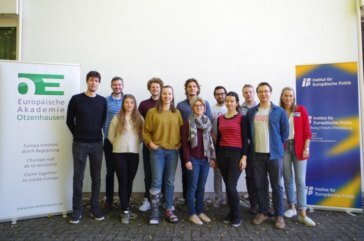 Thus, the #1stYoungCitizens’FutureLab formed the basis of the project #EngagEU, which aims at establishing a consultation about the visions and ideas of young citizens across Europe, and at empowering young citizens to actively set the agenda with these ideas in the run-up to the next European elections. To establish common ground for discussion, the participants firstly talked about past and current challenges to the European project, such as the rise of nationalism, the loss of public trust in European institutions, and the impact of the Brexit referendum. Participants agreed that it is necessary to foster European identity and solidarity, as well as to better communicate EU decision-making to the citizens in order to counteract these challenges. Against the backdrop of decreasing knowledge young citizens have about politics, more frequent generalizations and stereotypes, as well as the rising number of protest-voters, the pursuit of these goals and projects like #EngagEU become increasingly important. How to deal with “Fake News”, “Hate Speech” or “Bots”? To what extent do these unwanted side effects of digitalization influence political communication and which impact do they have on participation? Next to these challenges, the participants also discussed the benefits of digitalization, such as increased transparence and improved communication processes of decision-makers and citizens. First, political and civic education needs to be improved, in particular in schools. The participants suggested introducing “European studies” as an own subject or organizing a “Europe Week.” In addition, adult education should focus on European matters. The participants also underlined the need for deeper knowledge on digitalization and for improving digital skills to combat the widespread feeling of information overwhelm among citizens. Second, future digital infrastructure should respect net neutrality and the quality of information sources inter alia assisted by “fact-checking platforms.” Furthermore, online and offline debates should be better connected. Third, the participants called for more citizens’ consultation regarding regional topics, for example by making use of e-participation tools to establish more citizens’ participation at the local level. Fourth, the attendees proposed more participation opportunities for young European citizens. Next to a “Youth Parliament” with concrete and measurable possibilities for impact, the participants also recommended to improve the initiative “#FreeInterrail”. This should not only include access to the tickets but also supporting the participants for the duration of the trip, for example with better couchsurfing facilities or by making use of digital instruments to reduce the language barrier between travelers. Next to these four ideas, the participants highlighted two basic principles to be respected in the future: The first being a reduction of language barriers which would help to increase citizens’ participation, and connecting public spaces online and offline. This first exchange of ideas will serve as the basis for the #2ndYoungCitizens’FutureLab, which will be held by the Institut für Europäische Politik at the Europäische Akademie Otzenhausen on 29 and 30 November 2018. Further #YoungCitizens’FutureLabs in the run up to the next European elections will take place in Nice and Warsaw.